In spite of late planting and a cold April, it has been an exceptional year for tulips at The Watch House. They have flowered and flowered, and I have discovered some ravishing new varieties; well, new to me at least. 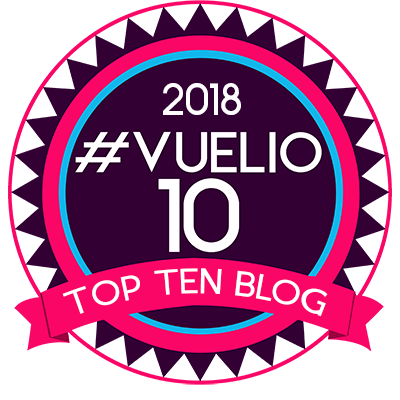 This post is devoted to sharing my top ten with you. Because of the quantity of bulbs I now buy every season, I changed last year from buying through retail catalogues such as Sarah Raven, and took my custom to J. Parkers wholesale instead. 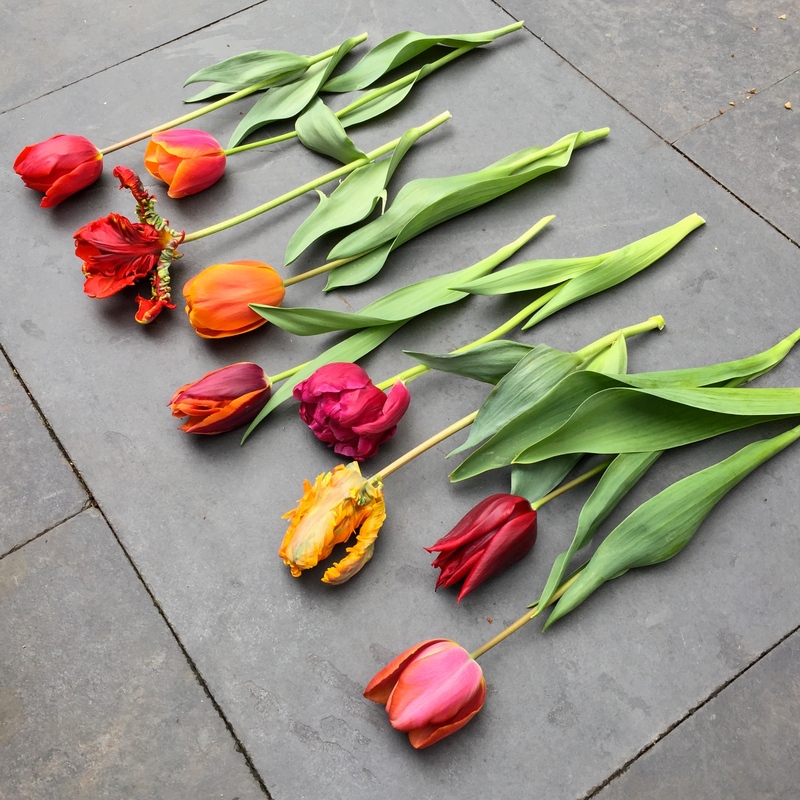 I did this with a heavy heart and some trepidation, as I rate Sarah Raven’s taste in tulips (and dahlias), and was not certain the quality would be as good elsewhere. Happily, I need not have worried as the bulbs from J. Parkers were of excellent quality, both storing and flowering well. The change of supplier did mean I was not able to buy some of last year’s favourites again. I have especially missed the deliciously fragrant Tulip ‘Queensday and peony-pink ‘Antraciet’, both doubles, and the single-flowered stunner ‘National Velvet’. However, the opportunity to try something new is never one I shy away from, and few of my new choices have disappointed: I could single out only ‘Portland’, which is a perfectly nice tulip but too poppy-red to complement its pot fellows. For the second year I have focussed entirely on a combination of orange, red, deep pink and aubergine. These are shades that tulips excel at, although they are beautiful in any colour. When eventually I regain possession of the ‘new’ garden from the painter and decorator, I will use this to experiment with alternative combinations. For spring 2018 I am thinking about an Easter palette of ivory, green, pastel pink and primrose yellow. This will play nicely with yellow brick walls and green paintwork on the windows. I have wanted to get my hands on bulbs of Tulip ‘Dom Pedro’ for years and am glad I kept up the search. It has flowered longest of all my top ten, tall stems remaining upright through storm and tempest. A venerable old variety, introduced in 1911, it’s stood the test of time. The flowers are described as being ‘Morocco-red on a cadmium-yellow ground‘ – I’d call it deep purplish-red. ‘Dom Pedro’ seems to me very similar to ‘Queen of the Night’ and I have wondered on and off if that’s what I was actually sent. Either way, I shall grow it again. Another tulip which seemed similar to one I have already grown in all but name, turns out to be the same flower. Tulip ‘Malaika’ is also sold as ‘Bruine Wimpel’, a variety I grew last year. The dull, copper-brown petals are enlivened by a flush of old-rose. In terms of fire power, ‘Malaika’ is rather like ‘Orange Dynasty’ with the lights switched off, but would appeal to flower arrangers and lovers of those subtle Cedric Morris shades that were so fashionable in the 1920s. According to Sarah Raven, who singled it out in her own top ten tulips, it’s also much beloved by Prince Charles. Tulip ‘Lasting Love’ has been a revelation, producing sumptuous oxblood-red flowers on stocky stems, carried above a swirling mass of wavy foliage. Even with a film of paint dust on the petals, the flowers are dazzlingly opulent and look even more exciting alongside lime green euphorbias. They are not to everyone’s taste, but I adore the frivolousness of parrot tulips. ‘Rococo’ I could never dispense with. Where others see diseased, convulsing blooms, I see a flowers with all the magificence of a scarlet macaw. If I could paint, which I regret I cannot, I’d want to paint parrot tulips, in oils, recording every flounce and absurdity of colour. For a change I thought I would try the parrot form of ‘Princess Irene’. The colouration of the petals is not as extreme as ‘Rococo’, but still worth studying close up. 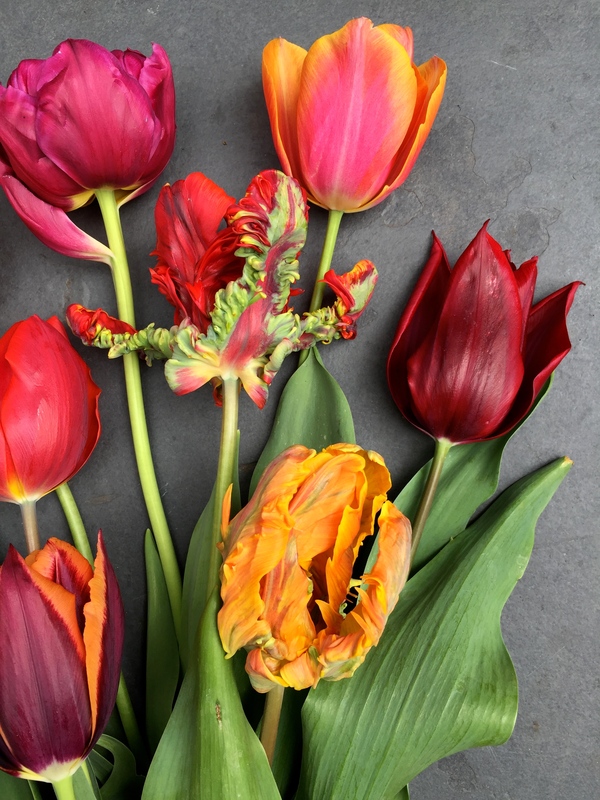 Those that are familiar with tulips will know that ‘Princess Irene’ is one of the oldest varieties available to gardeners. It is itself a sport of ‘Couleur Cardinal’, which has also found its way into my top ten this year. ‘Couleur Cardinal’ requires little introduction as it has been growing in the nation’s gardens since 1845, just 30 or so years after The Watch House was built. It is a stocky little tulip with short stems that grow bolt upright. I have planted 30+ bulbs in a flared bowl which suits their stature very well. The flowers are a rich, deep red flushed plum-purple and take adverse weather in their stride. I have already ticked myself off for not growing enough doubles this year. 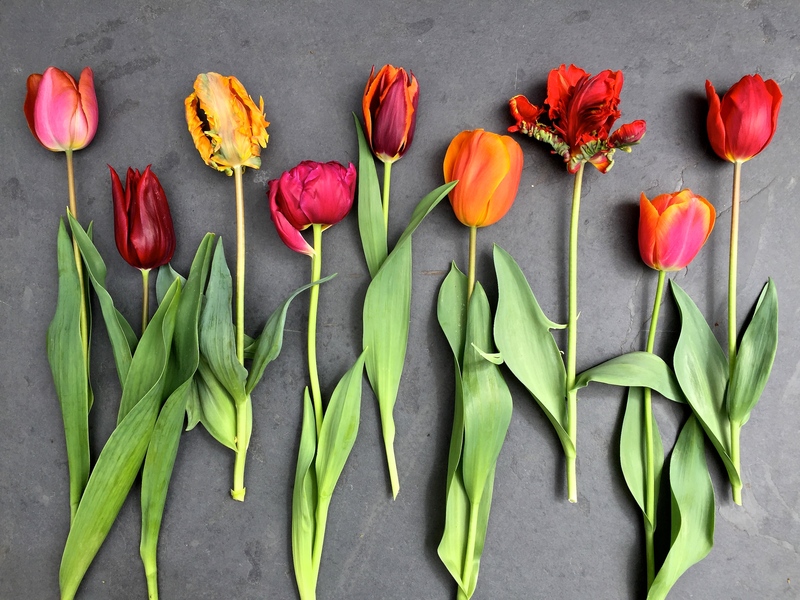 Although I prefer singles on the whole, they do offer variety where a number of tulips are grown and a lot of bang for your buck. When double tulips are grown in pots the sheer volume of petals can merge to create a solid mass, so I tend to plant fewer, or mix them together with a single variety. I selected ‘David Teniers’ imagining I was getting a deep, aubergine-coloured tulip, but found the flowers to be many degrees lighter in reality. The good thing about pots is that one can always move any that don’t work harmoniously once the blooms reveal their true colours. As it happens, ‘David Teniers’ has made a pretty good companion for ‘Orange Dynasty’, one of the most luminously lovely tulips I have ever cultivated. 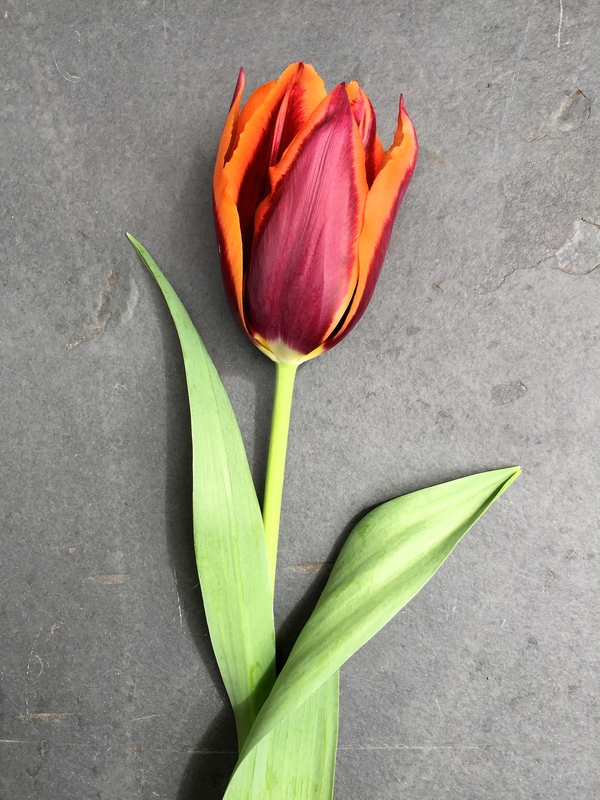 I have described the tutti-frutti tones of this mide season Triumph tulip in a previous post, but as a lover of all things bright and exotic this variety ticks all the right boxes. That leaves two tulips that might make good friends for one another. The first is ‘Christmas Orange’ which was one of the first to flower and is just about to go over. To have early tulips in bloom in May is quite exceptional, helped by the cool weather and by keeping the pots out of full sun. My garden gets the sun for just 4-5 hours every day and that’s quite sufficient to keep tulips happy. I can’t be certain if it’s prompted by the colour of the petals, but I am convinced ‘Christmas Orange’ smells of oranges. Whatever the perfume, it’s lovely. Below, on a slate paving slab in the garden I have positioned ‘Christmas Orange’ next to ‘Slawa‘. This jazzy tulip, with a name that means ‘fame’ in Polish’, is a corker. 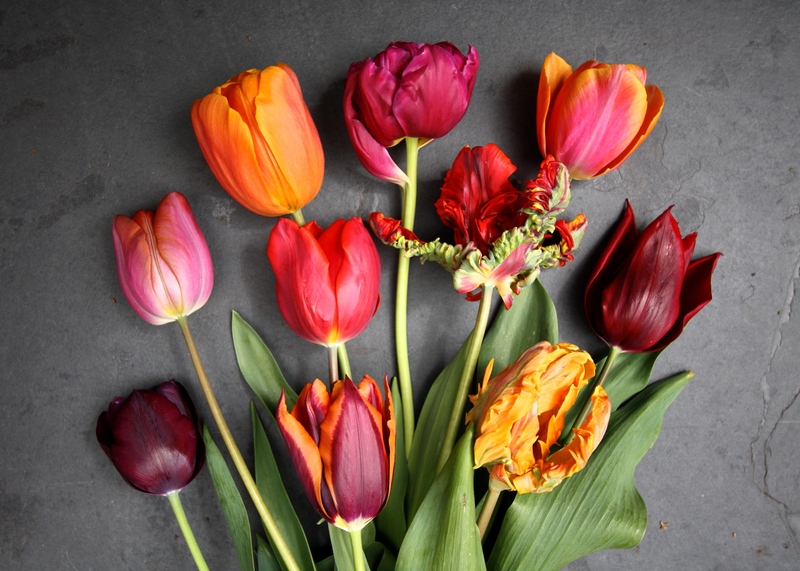 The petals look like tangerine chiffon stained with port wine and create quite a stir amongst plainer tulips. In another year I’d partner with a tulip like ‘Burgundy’ to balance the darker colours with the brights. As I write, every one of these varieties is in its prime and has been for at least two or three weeks. A warm spell now would put paid to the show pretty promptly, freeing up pots for summer planting, but leaving their dazzling impressions burnt deep in my retinas. Not for the faint hearted, my perfect ten tulips are guaranteed to keep your garden warm through the chilliest of springs. TFG. Stunning – they photograph so beautifully against the deep blue-grey stone. Keep them coming Dan, I always look forward to your posts, stunning pictures and great descriptions. Advice please? 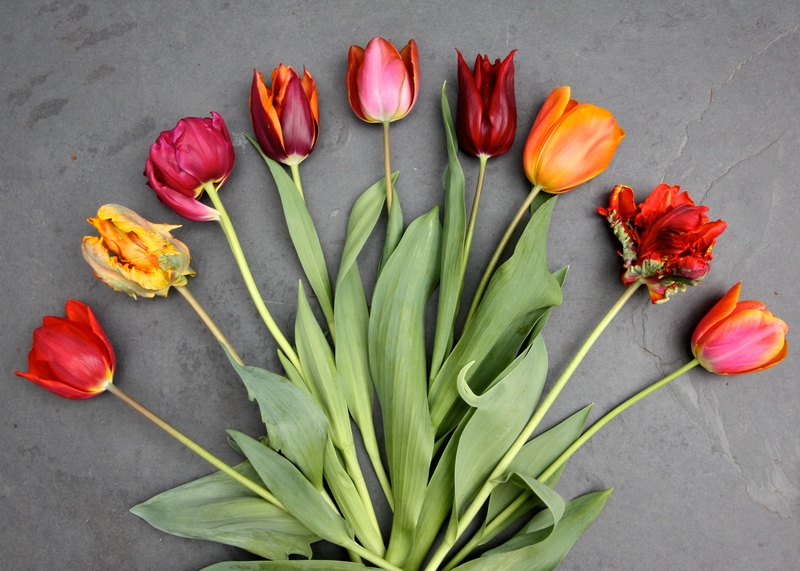 do you keep your tulips potted or lift and replant or replace every year? ( a mammoth task) I don’t have the soil or the room to replant into the garden. This is the first year i’ve been organised to plant in pots and they’ve been absolutely glorious – esp Apricot Beauty, but not sure what to do for next year? Again, a beautiful post. How do you do it? You always make everything look gorgeous. Fabulous photos, Dan. I’m not a great fan of the frilly ones but the colours are amazing. I’m a parrot tulip love too. Beautiful tulips! I am only just starting to realize my love of tulips. I can hardly wait until next spring to see all the varieties I plan on planting this fall! You’ll quickly become addicted. They are easy to grow and so rewarding when they flower. The hard bit is knowing when to stop! Thank you for sharing Dan, the colours are all beautiful. I cannot wait for the Parker’s catalogue to appear, several of your favourites are mine also, and I look forward to seeing what my efforts produce next spring. It’s always good to have some favourites and some spaces for new varieties every year. I’m occasionally underwhelmed by a tulip, but not often. ‘Rococo’ is very ‘you’ Helen. I could imagine you planting it with something like ‘Black Parrot’ or ‘Cuban Night’ for a sultry display. We can pick out some new varieties to try at Chelsea. Less than 2 weeks to go! I don’t know the Impression series. Triumph tulips are good for me as they are sturdy. My garden is very exposed so I can’t plant anything too willowy unless it’s ultra flexible. 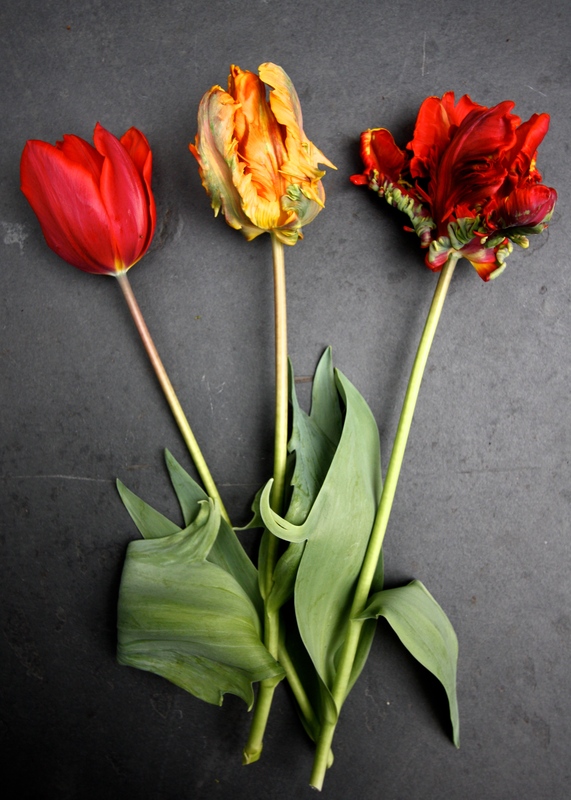 Many tulips snap off if they get too tall. I’ve planted a tulip called ‘Rai’ this year which is like ‘Rococo’ but purplish pink. Looking forward to that one flowering.